Running Backs: Too Much Of A Good Thing? It’s not often that a team has too much talent–especially at one position–because having depth is a good thing, right? 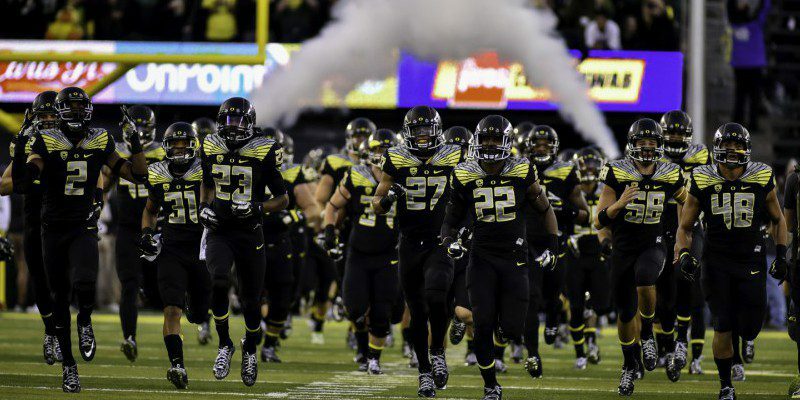 Well, with Byron Marshall (Sr.), Thomas Tyner (Jr.), and Royce Freeman (So.) all returning; there might not be enough carries to go around next year. Tyner scored two touchdowns in the Rose Bowl. There is no doubt the Ducks have found their feature back in Freeman. With him being the clear-cut number one next season, who will be number two on the depth chart? My money would be on Tyner. After returning from injury, Tyner seemed to be back to his explosive and physical self. He ran for 124 yards on just 13 carries in the Rose Bowl and ran hard downhill in the National Championship game, leading the team in rushing. 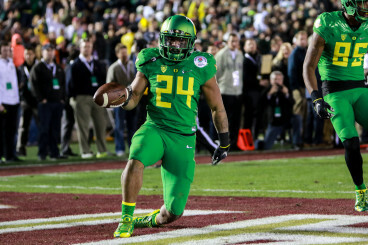 Freeman and Tyner would be a physical one-two punch for the Ducks in 2015, but where does that leave Marshall? If he is smart, he will stay at wide receiver–not only to help his team, but also to help his draft stock. So who will be the third option? Who will make a name for themselves as a freshman? All signs point to incoming freshman Taj Griffin becoming the fifth true freshman running back to see playing time in the last five years: De’Anthony Thomas, Marshall, Tyner, and Freeman have played as true freshman. Griffin, a Georgia native, is the 4th ranked running back in the nation according to ESPN, and scouts are raving about his speed. Griffin is only listed at 5’10” and 169 pounds, but his speed and small stature are great changes of pace from the size and power of Freeman and Tyner. Griffin could be used much like De’Anthony Thomas in 2011, when he had 55 carries for 595 yards and 7 touchdowns. Thomas also caught 46 passes for 605 yards and 9 touchdowns, and added two more scores on kick returns as the third running back in the rotation. Tony James should benefit from practicing with Freeman and Tyner. With Griffin coming in next season, what does that mean for the running backs still on the roster–most notably redshirt freshman Tony James? 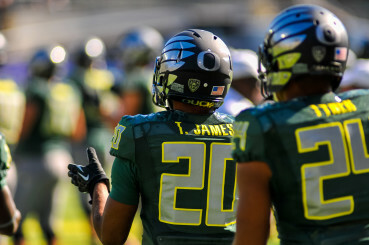 James is a speedster and was the 14th ranked running back in last years recruiting class, but he redshirted last year and watched as Royce Freeman became a freshman All-American and got named to the second-team all Pac-12 team. It’s unclear how long James will want to sit and wait, but he certainly adds talented depth if he decides to stay and wait his turn. And you never know, injuries do happen. Freeman, Tyner, and Griffin should be a dynamic ground attack giving the Ducks a backfield loaded with talent heading into 2015, even if Marshall primarily plays receiver. With veteran physical runners mixed with young speed and explosiveness off the bench, Oregon arguably has the most dangerous group of running backs in the country.